Origin and Habitat: Mexico. West-central Sonora. for about 100 km in the Sierra Bacha. from about 10 km north of El Desemboque San Ignacio north to Punta Cirio south of Puerto Libertad. Also both states in Baia California and at higher elevations on Isla Angel de In Guards in the Gulf of California. Altitude range: 10-660 metres above sea level. Habitat and ecology: Rocky granitic or volcanic slopes and canyons: Sonoran desertscrub. In Sonora limited to granite substrate: especially common on north-facing slopes and toward higher elevations. Throughout the range, winter rain is dependable, summer or early autumn rain occasional. They grow intermixed with the common ocotillo Fouquieria splendens, Fouquieria diguetii, Yucca valida, cacti and succulents such as Bursera microphylla and Pachycormus discolor. Seedlings are mostly found beneath shrubs, in rock crevices, or beside rocks. Under natural conditions, the plants grow fastest (4-5 cm/year) at a height of 2.5-3.5 m. Yearly measurements of height growth suggest that plants 15 m tall may be 500-600 years old. The flowers have a strong, sweet honeycomb fragrance and produce a noticeably sweetened nectar, and are visited by a variety of insects, including 15 species of bees as well as various beetles, ants, and butterflies as well as hummingbirds. 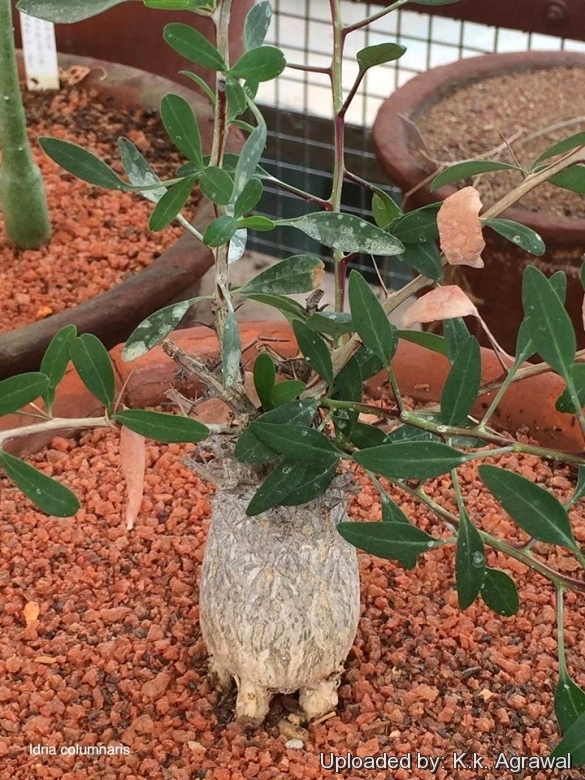 Description: Fouquieria columnaris, much better known under its old name Idria columnaris, is a tall pachycaul tree looking like a great upturned carrot with scraggly little secondary branches heightening the illusion with their resemblance to rootlets, and is one of the most unusual plants in the world. This tree grows up to 20 m tall. The tallest known plant was estimated to be 26.37 m. Vernacular names: "Cirio". "Boojum Tree". Leaves: Short-shoot leaves obovate or oblanceolate 11-21 mm long, 5-6 mm wide with 2-3 smaller leaves in their axils. Often slightly glaucous, entire rounded to acute or shallowly notched at tip. 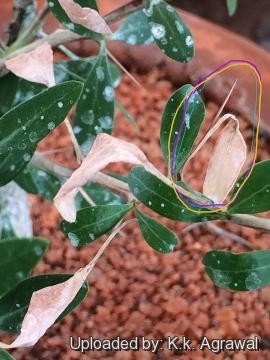 The leaves are transitory depending on water supply. Spines (hardened petioles): The stem of the leaf becomes a thorn once the leaf dries up. It gives double duty: 1). In growth it supports the leaf. 2). When the leaf is gone, it protects the branch/plant from browsing animals. Inflorescences (panicles): 17-65 or more cm long (including peduncle), mostly on the upper stem of the current year's growth at the top of he plant, and sometimes also from the ends of some of the lateral branches. The old dry, straw-coloured inflorescences persisting for much of the year. Flowers: Cream white to yellow, subsessile, fragrant, crowded in the upper part of the inflorescences, 6-8(-12) mm long. Sepals 5, rounded 3-4 mm long. Corolla narrowly campanulate 6-8 mm long. Stamens 10-12 exerted about 5 mm. Stigmas minutely 3-lobed, relatively short. Fruits (capsules): 3-valved, oblong 11-16 mm long. Seeds: Oblong, greatly compressed, membranously winged 6-8 mm long, 1.5-2 mm wide, wing 3-3.5 mm wide, 9-12 mm long, apparently remaining intact. Phenology: Flowers appear regularly in summer (July and August) and seeds in late autumn (October to mid-November). Chromosome number: 2n = 72. Notes: The plant is often characterized by bizarre branching and bending, especially in Baja California. The internal cylinder of wood in the stern is often quite thin with much support coming from water stored in the trunk. As water is lost during dry seasons, horizontal air cavities develop in the trunk. This weakens the stems, causing them to bend. In contrast columnar Cacti remain upright through drought because the pleated stems allow shrinkage without compromising rigidity. 3) Humphrey, R R, “The Boojum and its Home.” The Quarterly Review of Biology. 1975, 50 (4): 477–478. 4) Humphrey, R. R. 1970. “The Cirio: The tallest tree of the Sonoran Desert?” Cactus and Succulent Journal (U.S.) 42: 99-101. 5) Humphrey, R R 1974. “The Boojum and Its Home: Idria Calumnaris Kellogg and Its Ecological Niche,” University of Arizona Press, Tucson. 6) Humphrey, R R. 1991. “Montevideo Valley and its tallest recorded cirio.” Cactus and succulent Journal (U.S.) 63: 239-240. 7) Humphrey, R. R., A. B. Humphrey 1990. “Idria collumnaris: Age as determined by growth rate” Desert Plants 10: 51-54. 8) Humphrey, R R, D. B. Marx. 1980. “Distribution of the boojum tree (Idria columnaris) on the coast of Sonora. Mexico, as influenced by climate.” Desert Plants 2: 183-187. 9) Humphrey, R R, F. G. Werner. 1969. "Some records of bee visitations to the flowers of Idria columnaris." Journal of the Arizana Academy of Science 5: 243-244. 10) Felger, Richard; Mary B. Moser. (1985). "People of the desert and sea: ethnobotany of the Seri Indians" Tucson: University of Arizona Press. 11) Moser, Mary B.; Stephen A. Marlett (2005). “Comcáac quih yaza quih hant ihíip hac: Diccionario seri–español–inglés (in Spanish and English).” Hermosillo, Sonora: Universidad de Sonora and Plaza y Valdés Editores. 12) Wikipedia contributors. "Fouquieria columnaris." Wikipedia, The Free Encyclopedia. Wikipedia, The Free Encyclopedia, 28 Oct. 2014. Web. 18 Jan. 2015. 15) “Care of a Boojum Tree” Desert Gardening Guides, Desert Botanical Garden 1201 N. Galvin Parkway, Phoenix, AZ 85008 http://www.dbg.org Web. 18 Jan. 2015. Growth rate: It is a very, very slow-growing tree, but long lived, some are thought to have achieved over 500 years of growth.. Boojum trees are fairly slow growing, so they will remain happily in a container for a very long time. For maximum growth the plants need ample root space. Dormancy: Fouquieria columnaris are summer dormant. This means that beginning sometime in April plants begin to loose their leaves and reduce metabolic activity significantly. The plant blooms during this dormancy, usually in July and August. Leaves will reappear and growth will resume sometime after mid-September, occasionally as late as November. Soil: Needs a very well drained soil mix. Be careful that the plant is not placed in an area that accumulates water, or is in the fall of a roofdrip line. The addition of gravel, decomposed granite, or sand will help loosen heavier soils, thereby allowing the root system to get spread out and established evenly. Other soil amendments are not necessary. Transplanting: Large Boojum trees seldom survive transplanting. They are best planted in the fall, at the beginning of their growing cycle. However, a spring planting can be successful if care is given to shading the plant. Exposure: Boojum trees grow best in full sun to part shade. Very small plants should only be planted out if they can be protected from full sun by a bush or tree as they grow up. Larger plants do best in full sun, but even then plants need shade during the first summer to avoid sunburn. Sunburn will show up as a yellowing of the skin on the south or west side of the plant. They need freely circulating air. Watering: Watering should be greatly reduced during the lust summer months to prevent rotting. Plants are watered and allowed to dry thoroughly before watering again. In the cool weather, when the plant is actively growing, water a Boojum regularly. Small plants in pots may need water weekly. During this time, leaves which turn yellow or brown, or begin to drop are a sign of too little water. Plants in the ground, which are over 1 mt tall, do well with regular watering every 2-3 weeks during the cool season. While dormant, during the warm weather, Boojum trees require only enough water to keep them from shriveling. Leaves which turn yellow or brown and drop in late spring are a signal of the onset of dormancy, and cannot be encouraged to resprout with watering. Watch the tip; if it begins to shrivel or shrink, water the plant, otherwise it is best left alone. The onset of leaf buds, or the sudden appearance of leaves marks the end of the dormant period. Hardiness: Cold tender. However some older, established plants have survived overnight temperatures of -7°C in cultivation. Seedlings may die at -5.5”C. lants put in the ground should be covered when they are small, and placed in a very warm area of the yard away from cold air accumulators such as washes or depressions. Propagation: It is readily propagated by seeds and young plants an available in the horticultural trade. In habitat most seeds germinate during the winter rain but in cultivation, they germinate readily without pretreatment. In cultivation the seedlings may grow continuously through their first year but thereafter produce stem growth only from October to April.